This text was written for a special LGBTQI themed edition of the peer reviewed journal Fashion, Style and Popular Culture. 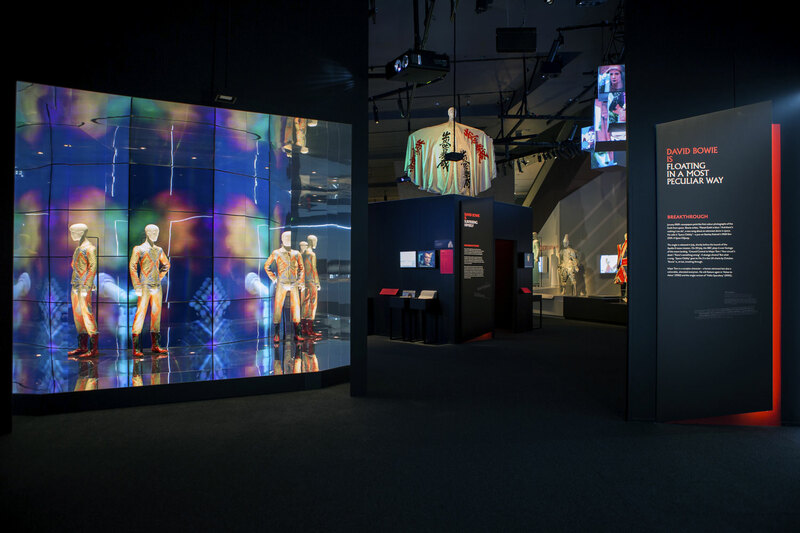 At short notice, the co-editor asked me to write, and I quote, “a queer focussed review of the Bowie exhibition at ACMI.” When I delivered the piece below, it was rejected as not being academic enough. Apparently they wanted a deconstruction of the exhibition, its layout, construction, themes, lighting, and good and bad points. No mention of LGBTQI issues mind you. What the kind of review they wanted has to do with a LGBTQI themed issue, I have absolutely no idea. If they had known anything about my writing, they would have known they would not get academic speak, but something a little more interesting. Their loss, our gain. 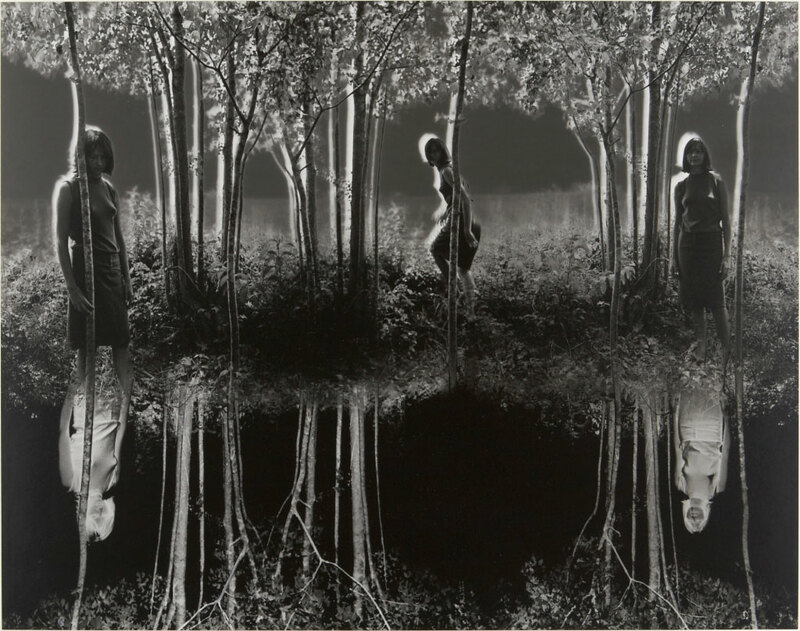 This is a flawed but mesmerising exhibition. Allow three to fours hours at least. If you are a Bowie fan it’s a 100% must see; and if you are an aficionado of contemporary culture, you will be amazed at the sources Bowie draws from to create his art, his personas. It did no harm, either, that Bowie had access to some of the most creative designers in the world for his costumes and sets, but he was the inventive force. What a man, what an artist, not just a man who feel to earth, but a man who changed the world. The year was 1975. In London, six years after that seminal event of early gay liberation, the Stonewall Riots, six years after the landing on the moon, and six years after the release of David Bowie’s single, Space Oddity, I came out as a gay man age 17. At the time I felt a bit of a space oddity myself, troubled by my hidden identity and the double life I was leading. My first act of rebellion was to walk into a newsagent at Notting Hill Gate underground station, pick up a copy of Gay Times, fling the money at the store attendant and run from the place as red as a beetroot. I was so embarrassed. Things quickly changed. I had been listening to Bowie’s music since my early days in boarding school – The Man Who Sold the World, Hunky Dory, Ziggy Stardust, Aladdin Sane – and now, after outing myself, I rocked up to the Royal College of Music with silver hair, wearing the most outrageous satin pink and white bomber jacket, with rings on every finger. I walked down St. Albans high street on a Saturday morning through the market in fake white fur coat and eye shadow. It’s only now, forty years later, that I realise I was channelling my inner Bowie. 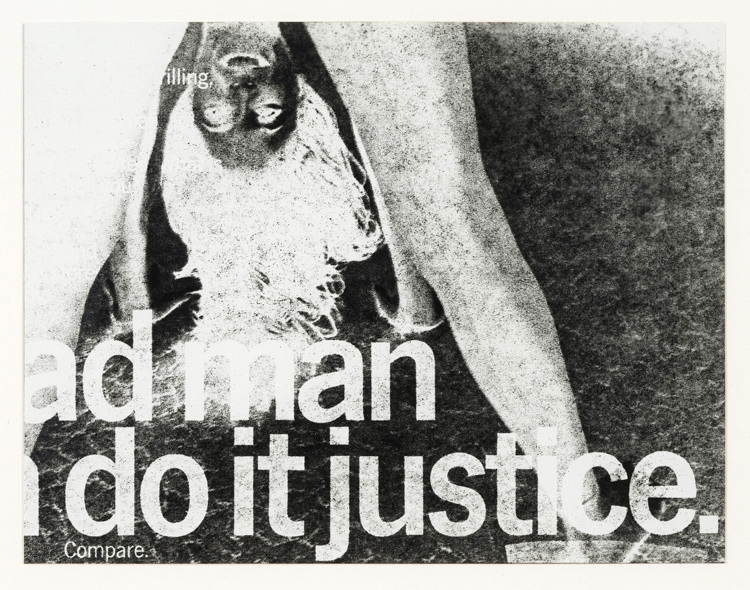 This was the era of Campaign for Homosexual Equality (CHE) in England, where we had to gather in people’s lounge rooms to meet other gay men, or once a month at a disco in country Hertfordshire. Or we went to the Pan Club in Luton where drag queens peered imperiously down at us through a grill before they allowed us through the door. The best thing was going to Scandals or Adams night clubs in London, where we danced on illuminated glass dance floors (like in Saturday Night Fever) and wore our army uniforms. We could be whoever we wanted to be. And this was all influenced by the multiple persona of Bowie. 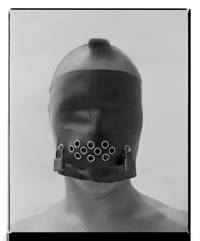 Like an intelligent bower bird, Bowie constructed his different personae through bricolage, building them from cultural signifiers such as German Expressionism, Marlene Dietrich, Sonia Delaunay, Metropolis, Hollywood, Japanese film, JG Ballard and Clockwork Orange, to name just a few. My gay friends and I did much the same. Like Bowie, for us it wasn’t so much about sexuality but about androgyny and the public play of gender (although the two are obviously interlinked). 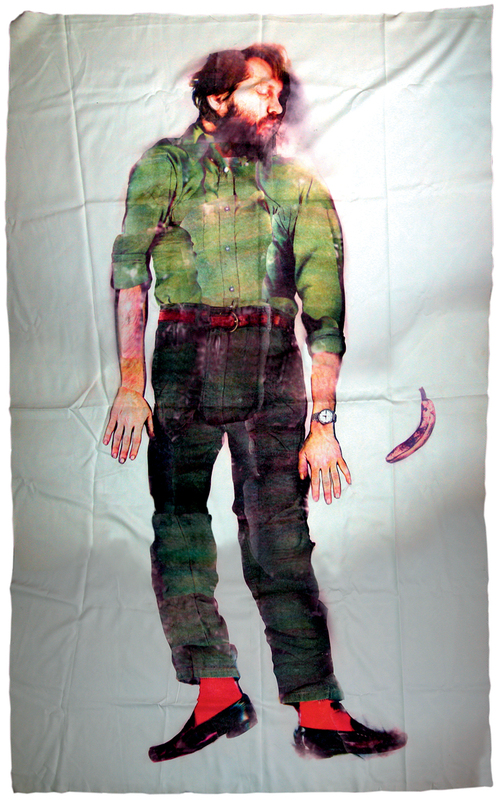 We adored David, a self-educated lad from a poor working class family, initially a Mod, who created his own universe of creatures and characters. Glam yes, but so much more than just putting on a costume like Kiss, David lived and breathed his worlds and we, his fans, believed in him. Not so much gender bender as cultural gender blender. Critical to this time in my life was the period that followed Ziggy: Young Americans and the Thin White Duke. I got heavily into soul music, going to a basement nightclub behind Bang on Tottenham Court Road, where they played reggae, Barry White and the Love Unlimited Orchestra… and David Bowie. I used to pretend to be one of the back up singers on the song Young Americans: “Young American, young American, she wants the young American.” Bowie is tight. Singing my all time favourite track of his, Young Americans, Bowie is a vocalist like no other. What a voice. Team that with charisma, soul, style, and all the moves … hands on hips, guitar slung backwards, padded shoulders to die for, cheekbones that you could cut with a knife and a presence that is just luminous. No wonder I loved him as an adolescent, he was my Hero. As someone commented on the YouTube live performance of the song, “ain’t there 1 goddam song that can make me breakdown + cry*”. From talking to other gay men, I know that the Young Americans album was also critical for them – all cinched waist, high cheekbones, eye shadow, padded shoulders, flaming hair and soul music. Which leads me on to David Bowie is, an exhibition at the Australian Centre for the Moving Image (ACMI) in Melbourne. 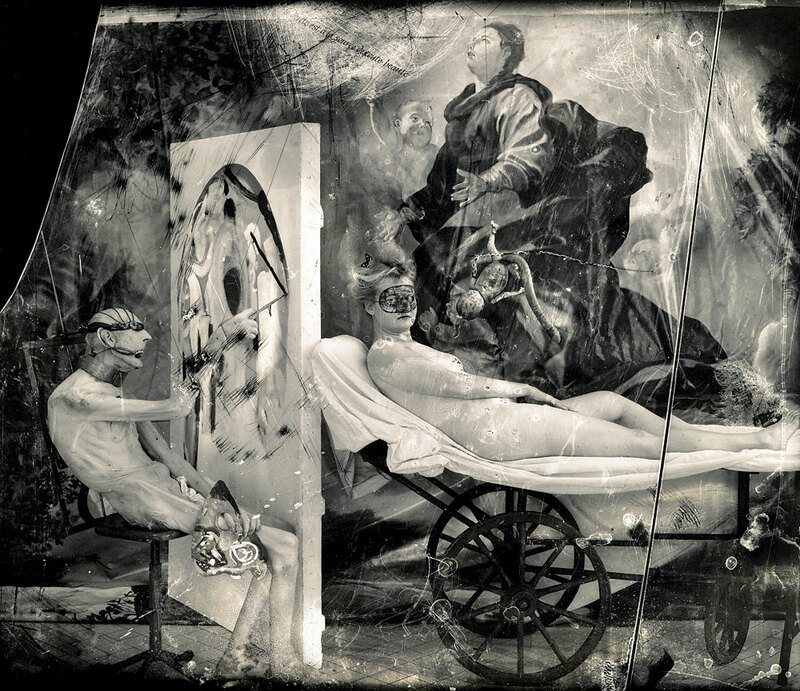 This is a fascinating but flawed exploration of the life of one of the world’s great artists. 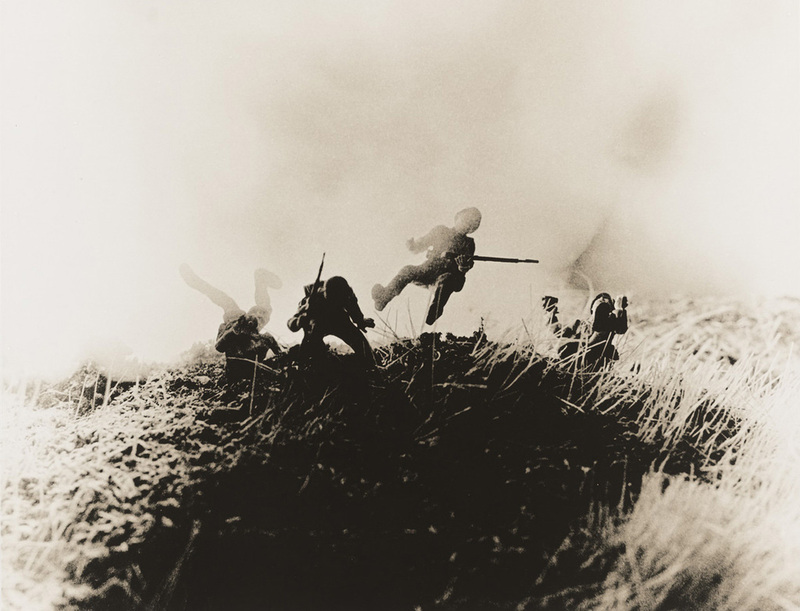 To see his early life, influences, and upbringing, and to have access to his personal archives – especially the wonderful sketches and storyboards showing his creative process – is invaluable. 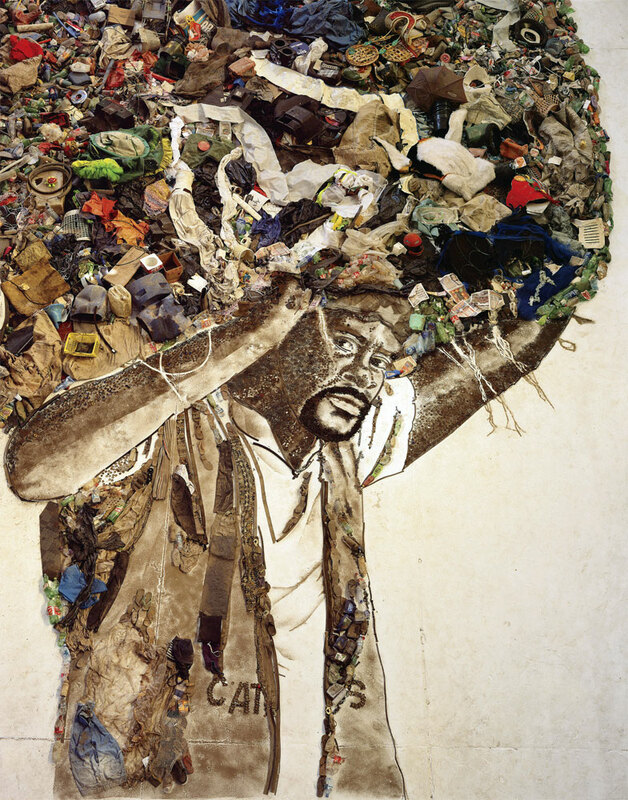 One of the strongest elements of the performance is how the exhibition links his art to the many cultural signifiers he used to construct it: from collage to construction. 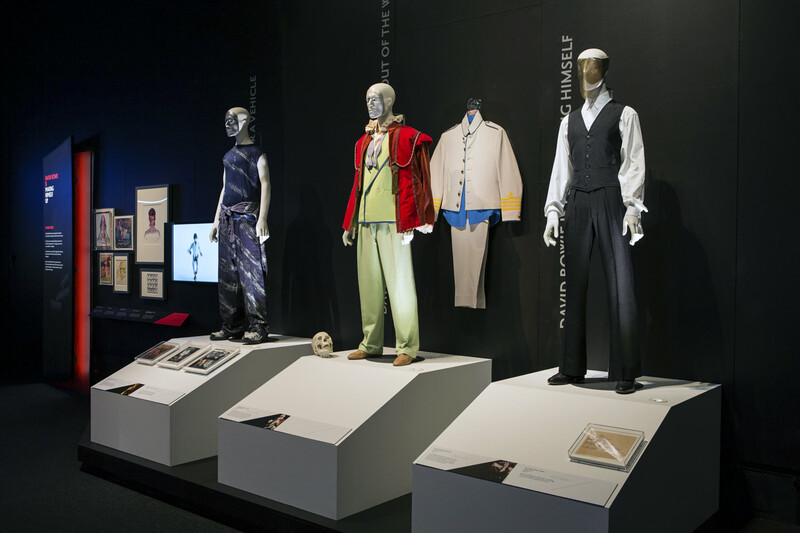 The costumes are magnificent including the additional Australian content, like the Pierrot costume from Ashes to Ashes. 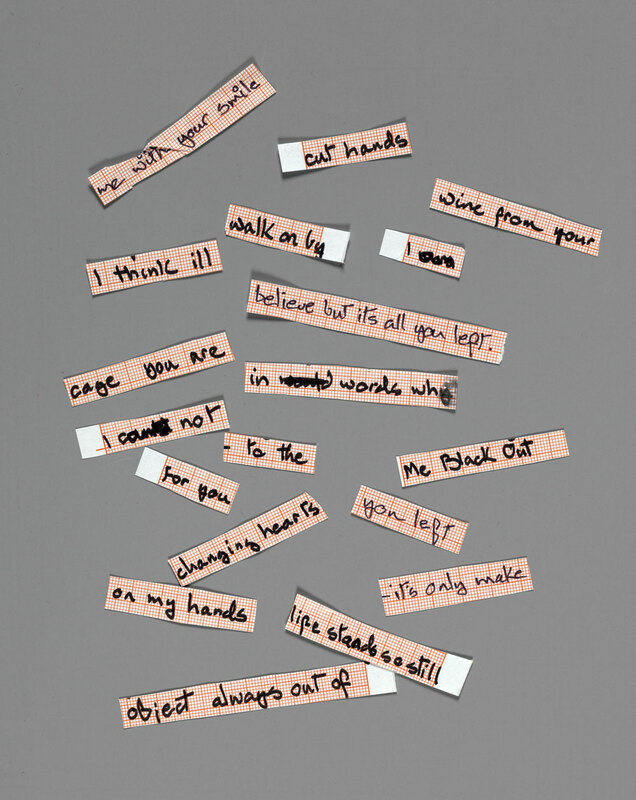 To see artefacts such as the original handwritten stanzas of Ziggy Stardust and Fame is as close as many of us will get to the source of greatness. 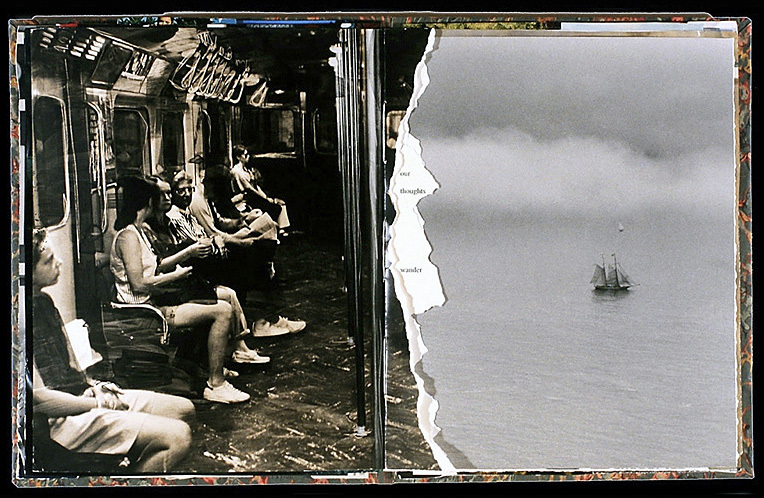 Much less successful was the thematic layout of the exhibition. Sections on film stars, 1930s, and Berlin cabaret (to name but a few), in non-chronological order, made it difficult to comprehend the development of each character and their place in the flow of time and space. While this assemblage of ideas might mimic how Bowie actually constructed his characters, quickly moving from one to another, and then reviving the same character many years later (for example, Space Oddity‘s Major Tom of 1969 and then creating a sequel in Ashes to Ashes in 1980), the imitative representation, or mimesis, of Bowie’s process in the layout of the exhibition simply did not work. Knowing how important Young Americans was to my own gay history, I searched for about 15 minutes with a guide from the exhibition looking for references to Young Americans and the influence of soul music on Bowie. We eventually found just two Thin White Duke suits tucked away right at the end of the show. In the bowels of the dark, subterranean bunker that is ACMI too many artefacts were crammed into too small a location. 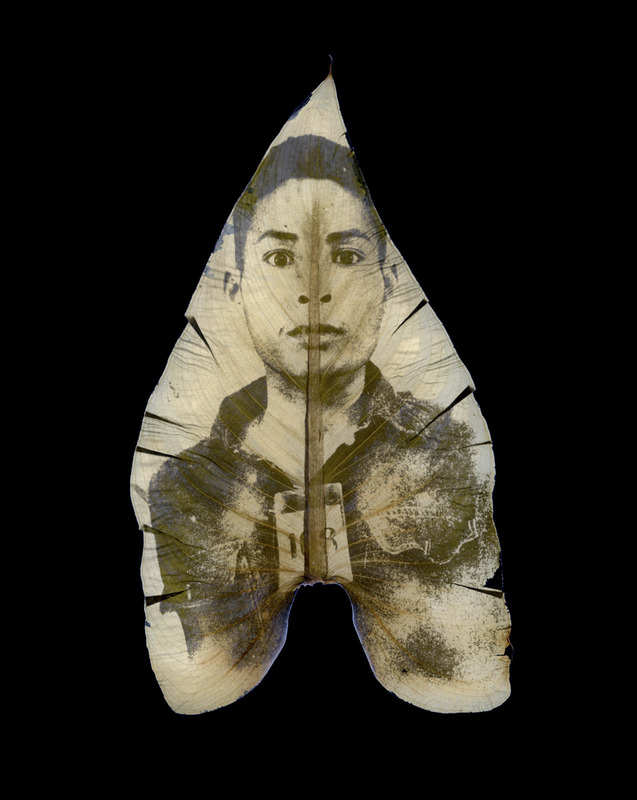 The artefacts, the ideas and the art have little room to breathe. 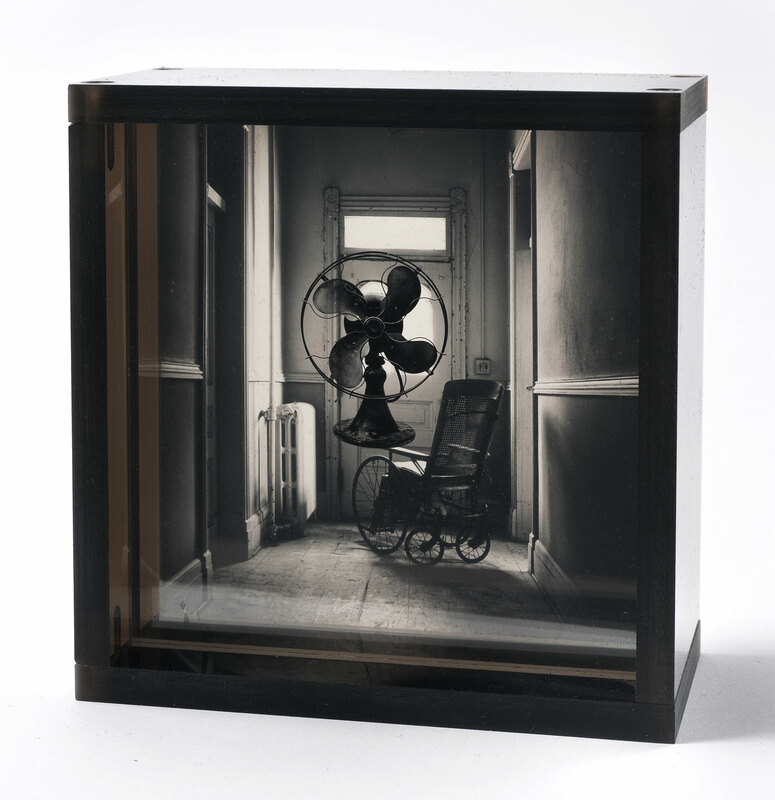 Having said that, this is still a mesmerising exhibition. Allow three to fours hours at least. If you are a Bowie fan it’s a 100% must see; and if you are an aficionado of contemporary culture, you will be amazed at the sources Bowie draws from to create his art, his personas. It did no harm, either, that Bowie had access to some of the most creative designers in the world for his costumes and sets, but he was the inventive force. What a man, what an artist, not just a man who feel to earth, but a man who changed the world. 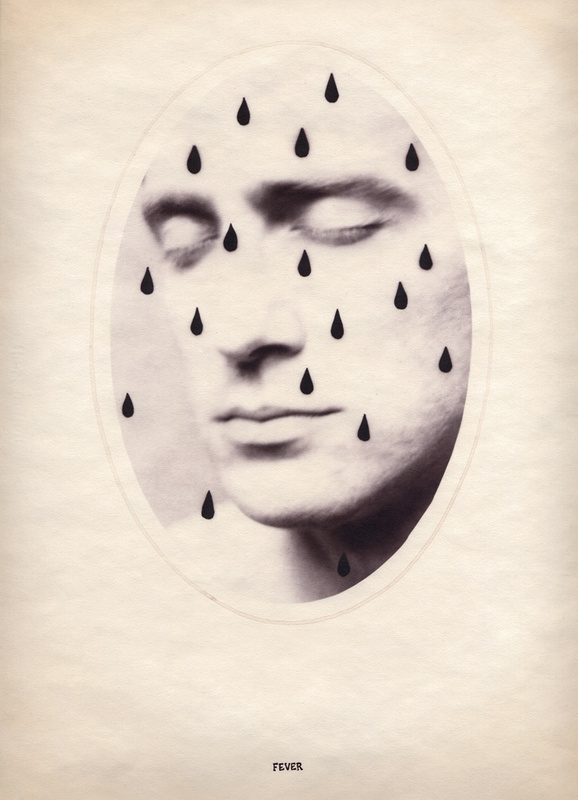 He was REAL, his personae were REAL, his art was REAL. He was an astronaut of inner space and when he looked down the barrel of the lens he spoke to young rebels in an authentic voice. He was our hero and no one else’s. As the singer Sylvester would later say: “You make me feel mighty real.” Chimerical, pansexual David, we love you! David or ‘Davie’ Jones, as he was then known, became heavily involved in London’s burgeoning music scene at a young age. 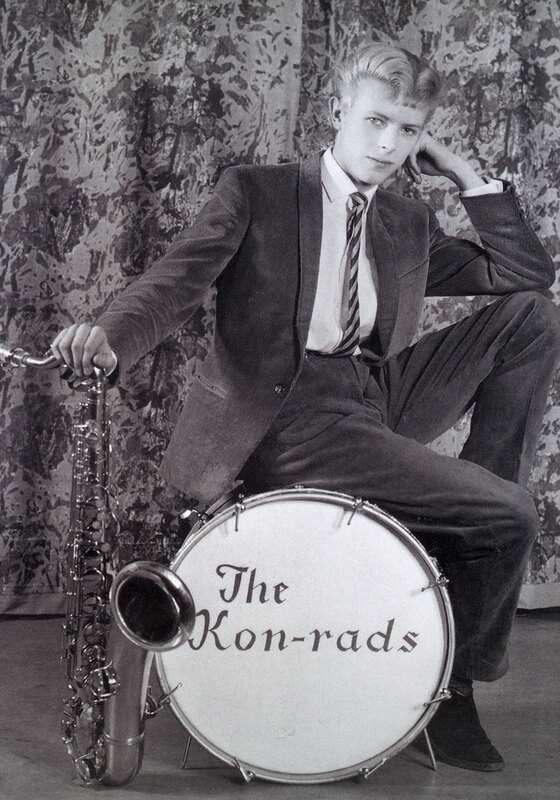 Before leaving school at the age of 16, he had already joined the band The Kon-rads, playing saxophone and singing vocals. Demonstrating the experimental energy that has driven his solo career, Bowie spent the 1960s trying out different musical, artistic and sartorial styles and performing with several different bands. In 1965 he changed his stage name to David Bowie. 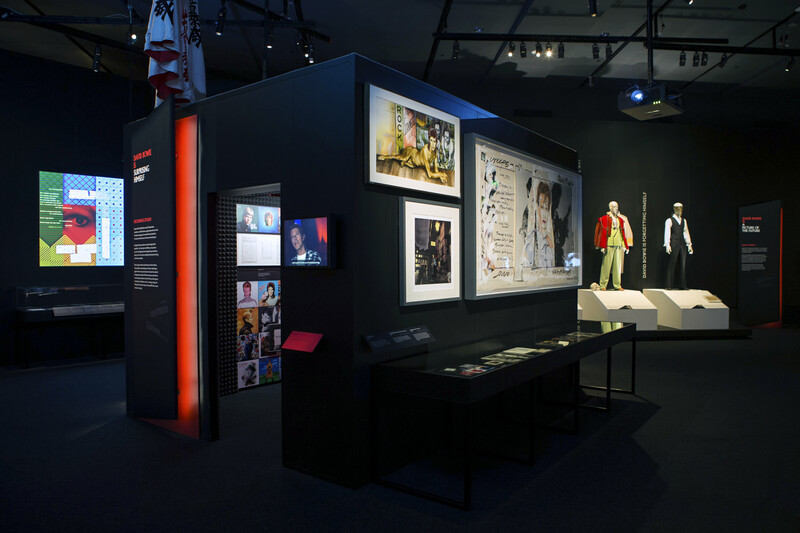 The exhibition features several objects from Bowie’s early career including sketches of set, costume and poster designs created for his first bands and footage of early performances. On 6 July 1972 David Bowie performed Starman, the first single from his album The Rise and Fall of Ziggy Stardust and the Spiders from Mars, on BBC One’s Top of the Pops. This pivotal performance was crucial in making Bowie a music star and is acclaimed as a watershed moment which changed rock music and youth culture forever. 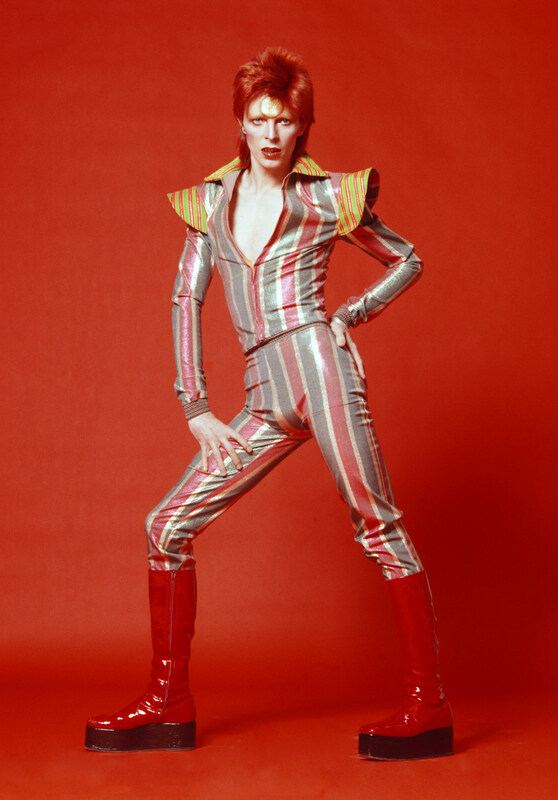 Appearing on national television with flame-orange hair, make-up, multi-coloured clothing and red patent boots, Ziggy’s otherworldly look and sexual ambiguity created a seismic shift in pop culture. 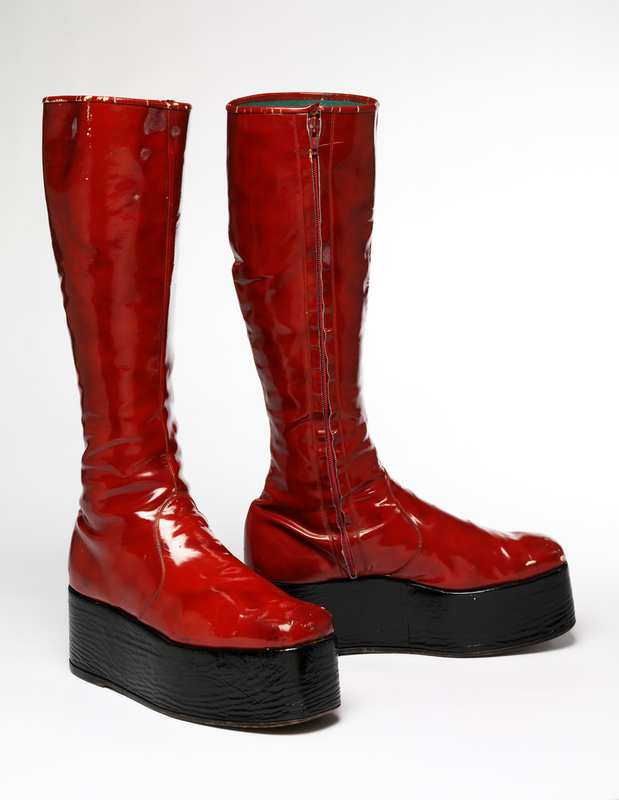 The exhibition features the original suit and boots created by Freddie Burretti and designed in collaboration with Bowie, who took inspiration from the costumes worn by the ‘droogs’ street gang in Stanley Kubrick’s film adaptation of A Clockwork Orange (1971). 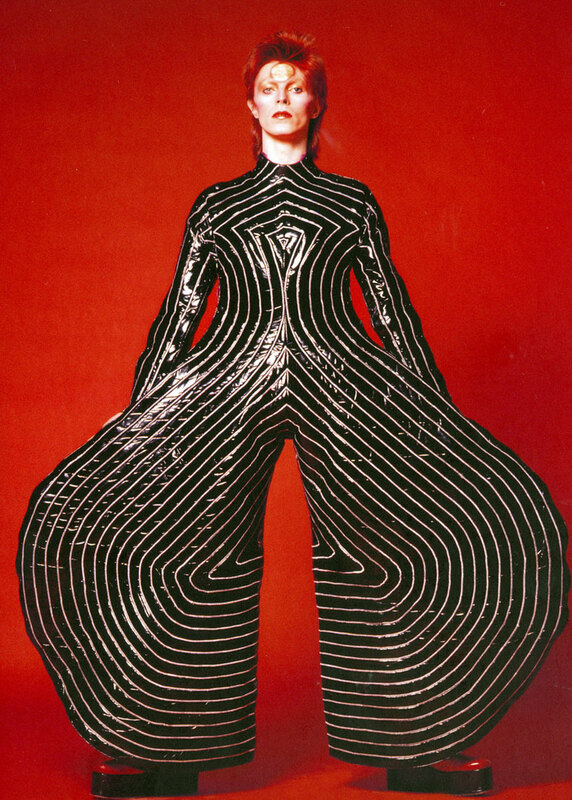 Bowie first saw the work of Japanese fashion designer Kansai Yamamoto at the exhibition Kansai in London in 1971. He could not afford the original designs so copied the look instead, recruiting friends such as Natasha Korniloff and Freddie Burretti to create cheaper versions of Yamamoto’s signature bodysuits and platform boots. 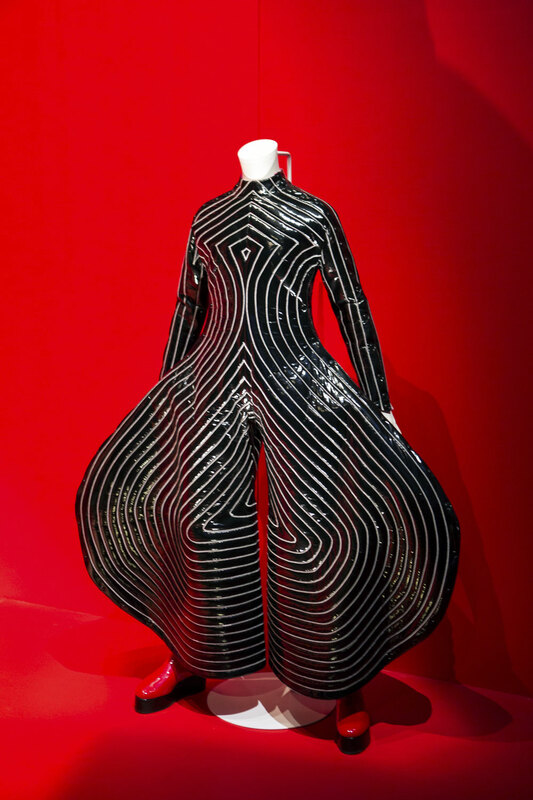 After the success of Ziggy Stardust, Bowie approached Yamamoto and commissioned a set of even more flamboyant stage costumes for the Aladdin Sane tour in 1973. These outfits, inspired by the style of Japanese samurai and kabuki actors, are outrageous, sculptural and eye-catching. 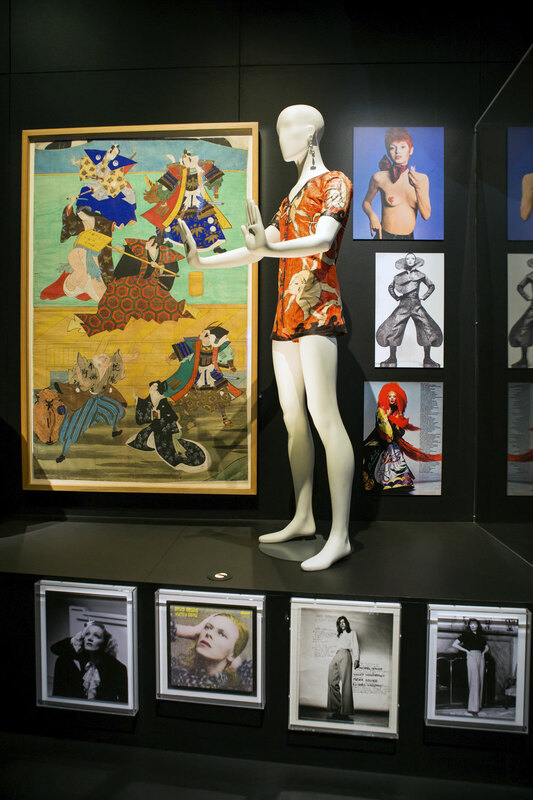 The exhibition features several Kansai Yamamoto costumes including the black and white striped bodysuit and a white cloak with Japanese kanji lettering spelling out ‘David Bowie’. 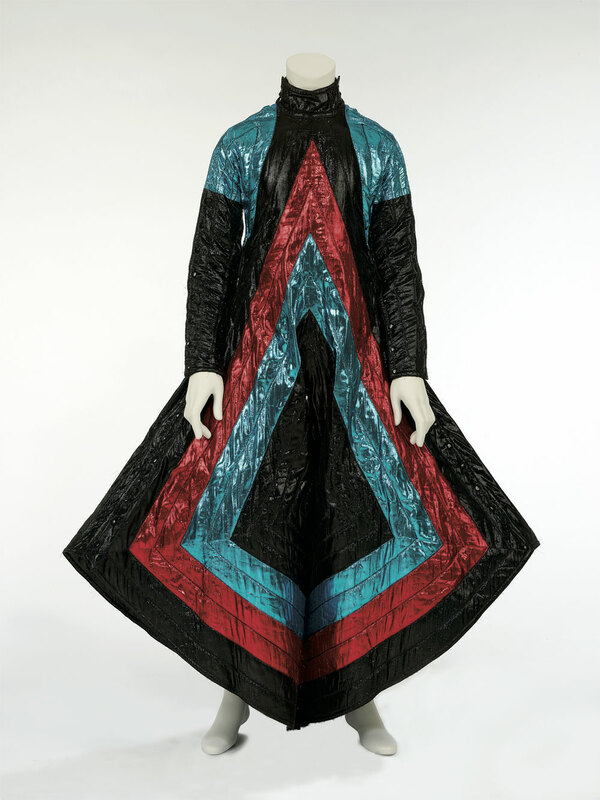 A flamboyant suit from Yamamoto’s 1971 exhibition which he gifted to the V&A at the time is also on display. 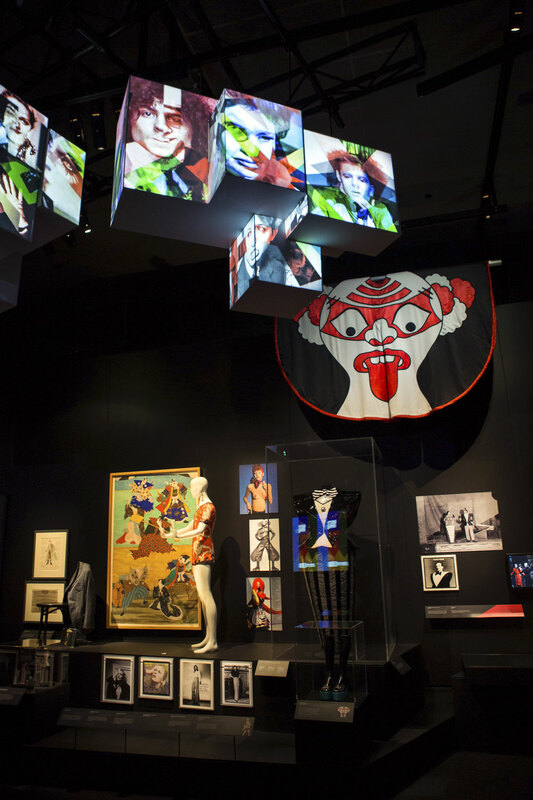 “The Australian Centre for the Moving Image (ACMI) today launched the critically acclaimed exhibition celebrating one of the most influential artists in music, film and video, fashion and performance. 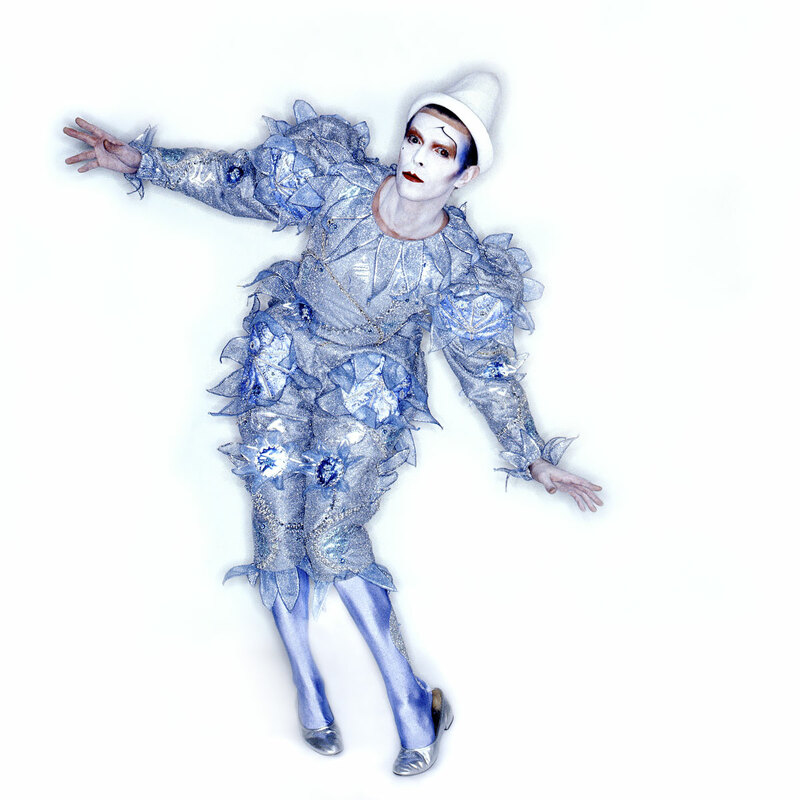 David Bowie is comes to ACMI from London’s Victoria and Albert Museum (V&A) for a strictly limited season from 16 July 2015 as part of the Victorian Government’s Melbourne Winter Masterpieces series. 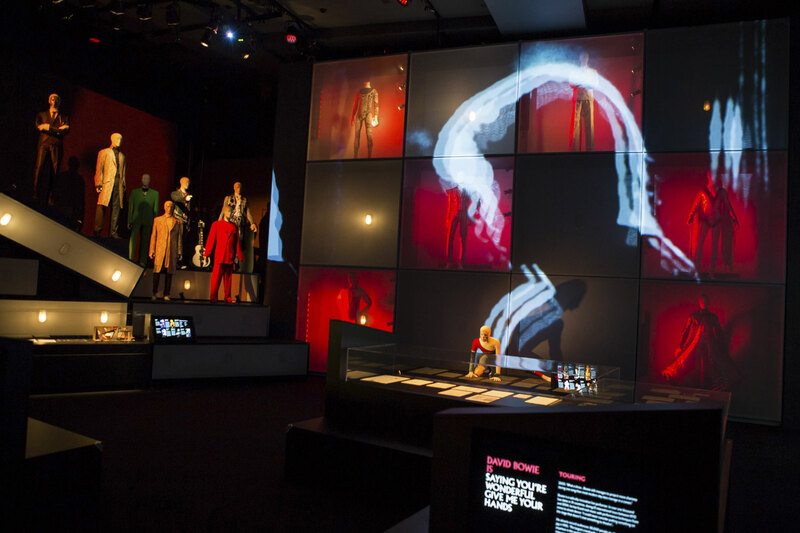 Seen by over 1 million people worldwide at sell-out shows in London, Chicago, Sao Paolo, Paris, and Berlin, David Bowie is was conceived by the prestigious V&A in London, where it premiered in March 2013 before quickly becoming V&A’s fastest selling show. This once-in-a-lifetime experience, now in its only Australasian season, is set to take Melbourne by storm. 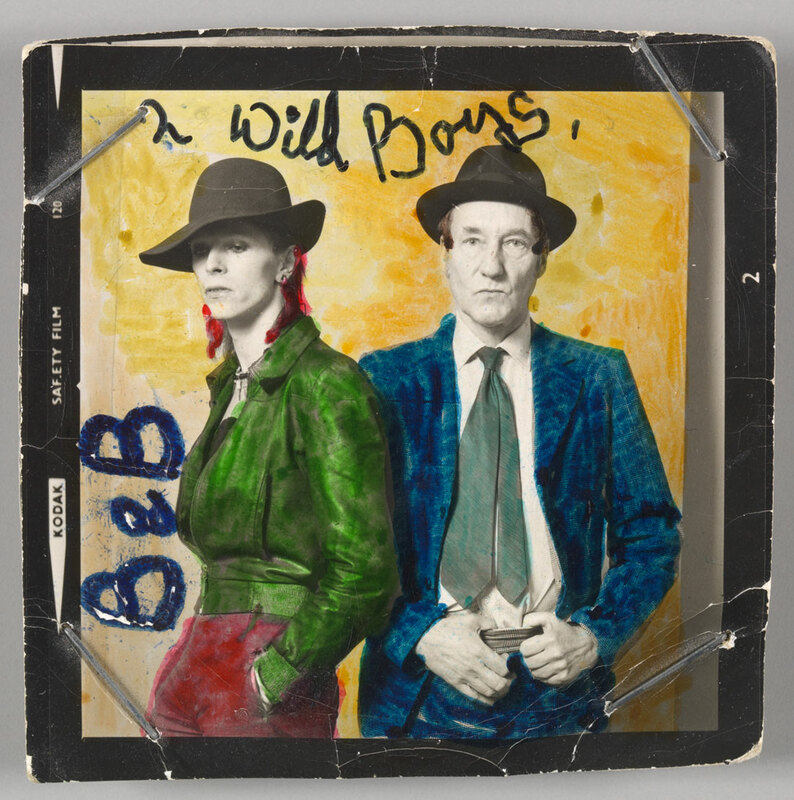 Drawing upon unprecedented access to objects from the David Bowie Archive, the exhibition charts the extraordinary career of the boy from London who became an iconic artist and cultural innovator. David Bowie is features over 50 legendary costumes, original stage set designs, handwritten lyric sheets, album artwork, rare film, video and photographs, and interviews with key collaborators. 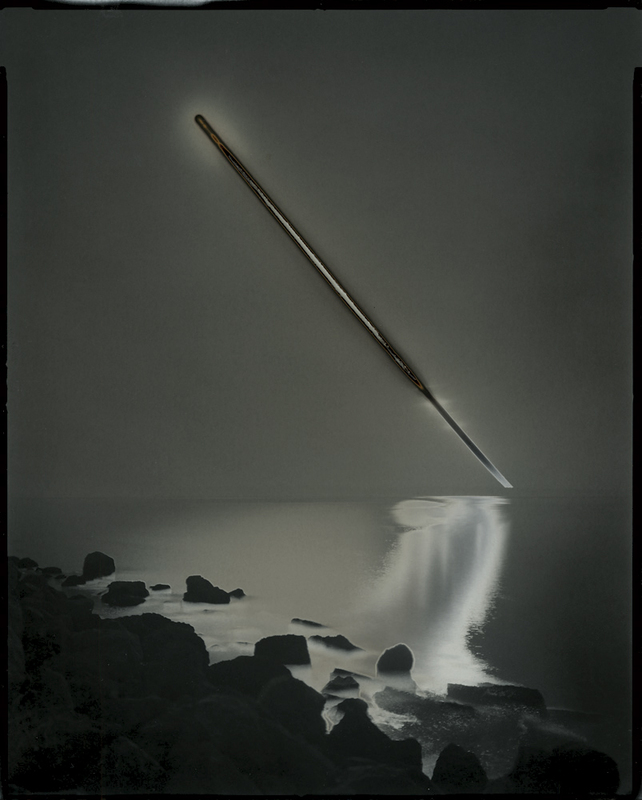 Special displays explore the artistic chameleon’s continuing influences as a musician, stage performer, writer and actor. The exhibition offers insight into Bowie’s early years and his first steps musical greatness. 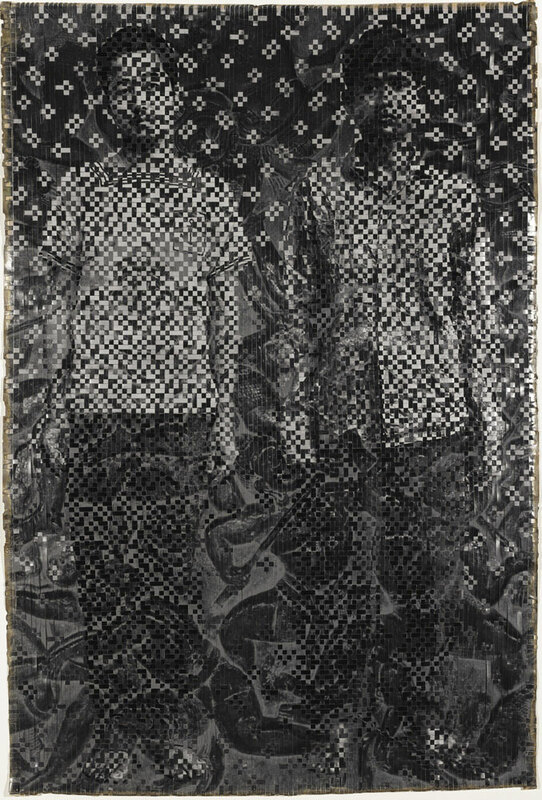 The creative aspiration of the young David Robert Jones are showcased by early photographs and Bowie’s sketches for stage sets and costumes created for his bands The Kon-rads and The Delta Lemons in the 1960s. Bowie’s first major hit Space Oddity (1969) and the introduction of the fictional character Major Tom inspired by Stanley Kubrick’s 1968 film 2001: A Space Odyssey granted him critical and commercial success as an established solo artist. His cinematic influences abound with his elaborate storyboards and set design for the Diamond Dogs tour (1974) inspired by Fritz Lang’s film Metropolis (1927). 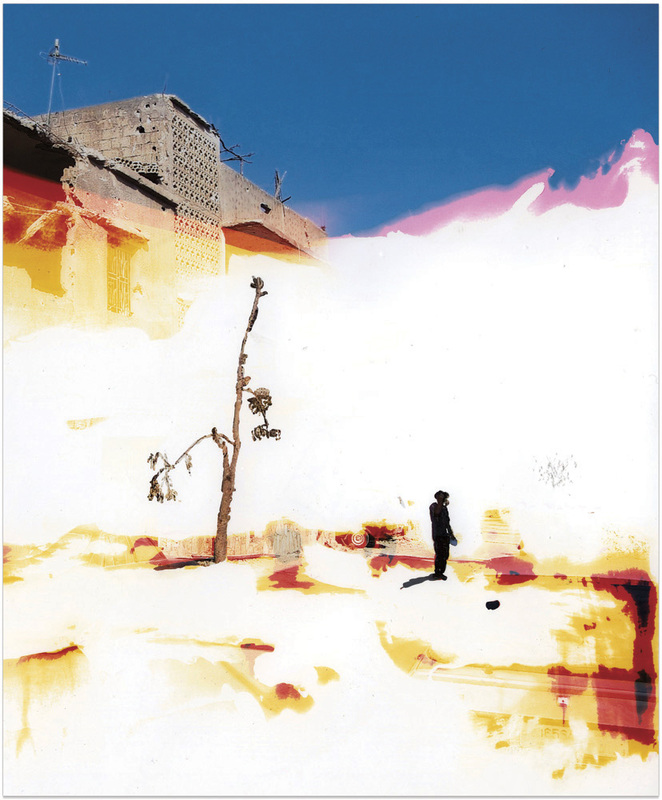 Excerpts and props from Bowie’s on-screen performance in films including The Man Who Fell to Earth (1976), Labyrinth (1986), Basquiat (1996) and The Prestige (2006) show how Bowie has continually explored different notions of character and drawn together the numerous cultural influences that feed into his work. 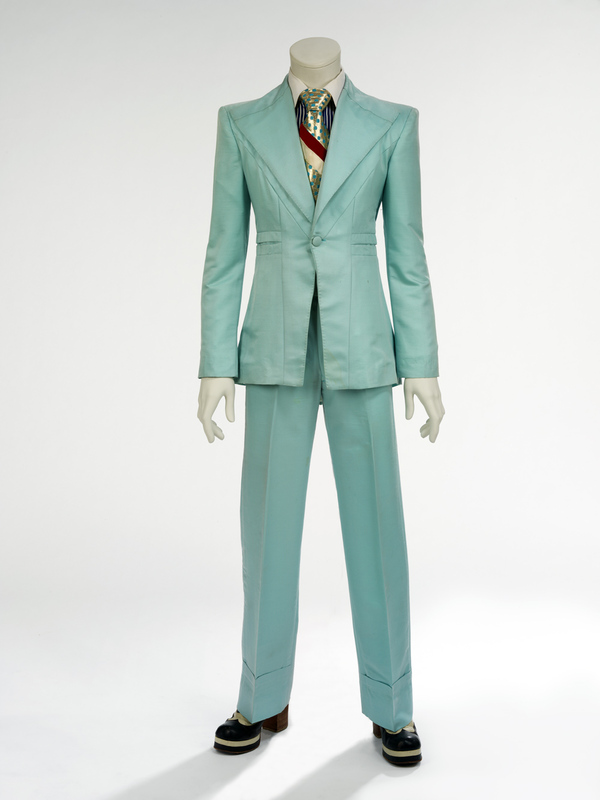 On display is the original multi-coloured suit worn for the pivotal performance of Starman on Top of the Pops in July 1972. 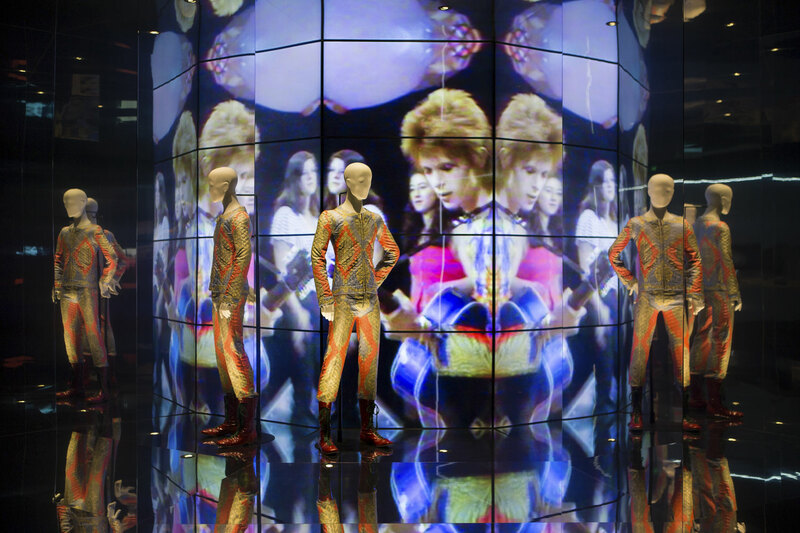 An interactive audio-visual display presents some of Bowie’s most ambitious music videos including DJ (1979) and The Hearts Filthy Lesson (1995). Immersive, large-scale projections show recently uncovered footage of Bowie performing Jean Genie on Top of the Pops in 1973 and excerpts from D.A. Pennebaker’s film Ziggy Stardust and the Spiders from Mars: The Motion Picture (1973). 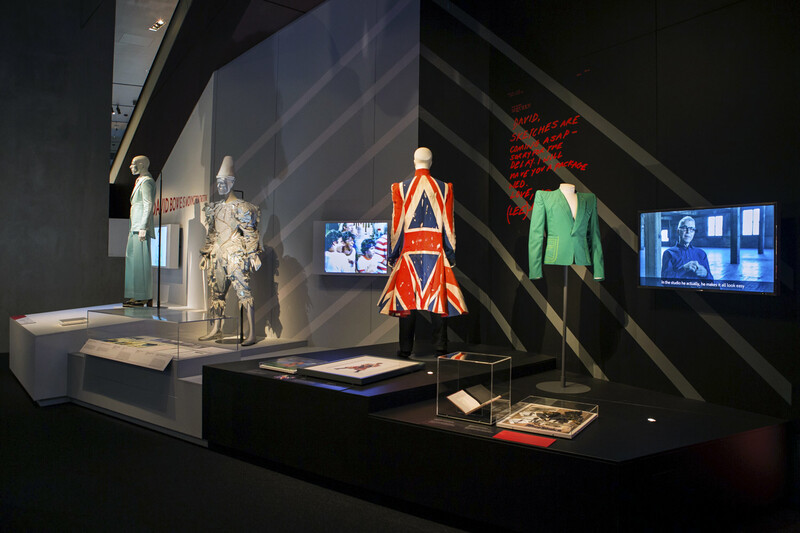 Bowie’s collaborations with artists and designers in the fields of fashion, sound, graphics, theatre, art and film are explored throughout the exhibition. 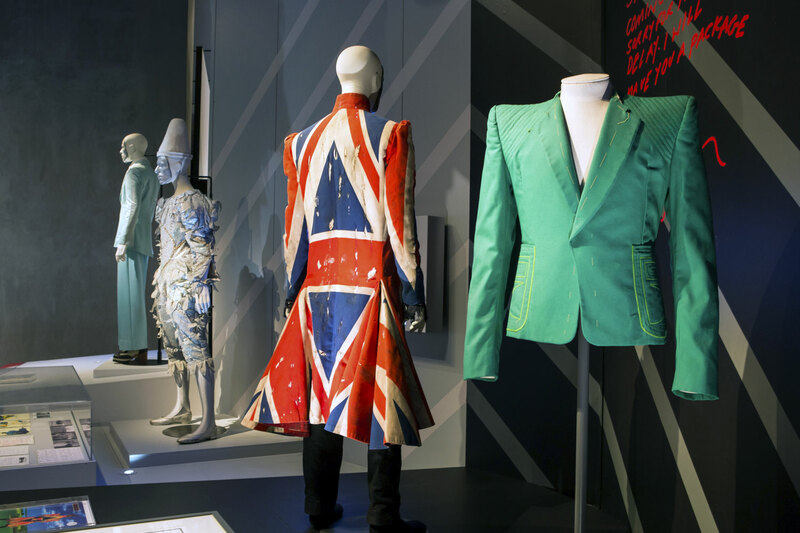 On display are more than 50 stage costumes including Ziggy Stardust bodysuits (1972) designed by Freddie Burretti, Kansai Yamamoto’s flamboyant creations for the Aladdin Sane tour (1973), and the Union Jack coat designed by Bowie and Alexander McQueen for the Earthling album cover (1997). An area has been dedicated to the monochrome theatricality of Bowie’s Berlin period and the creation of the Thin White Duke persona identified with the Station to Station album and tour (1976). 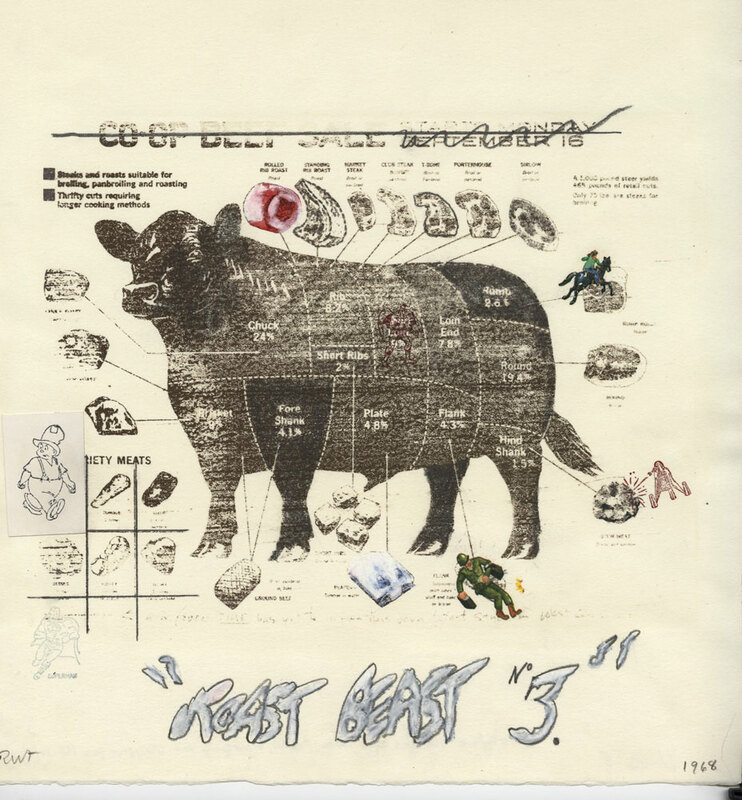 It also investigates the series of experimental records he produced between 1977 and 1979 whilst living in Germany, known as the Berlin Trilogy. The exhibition offers insight into Bowie’s early years and his first steps towards musical success. 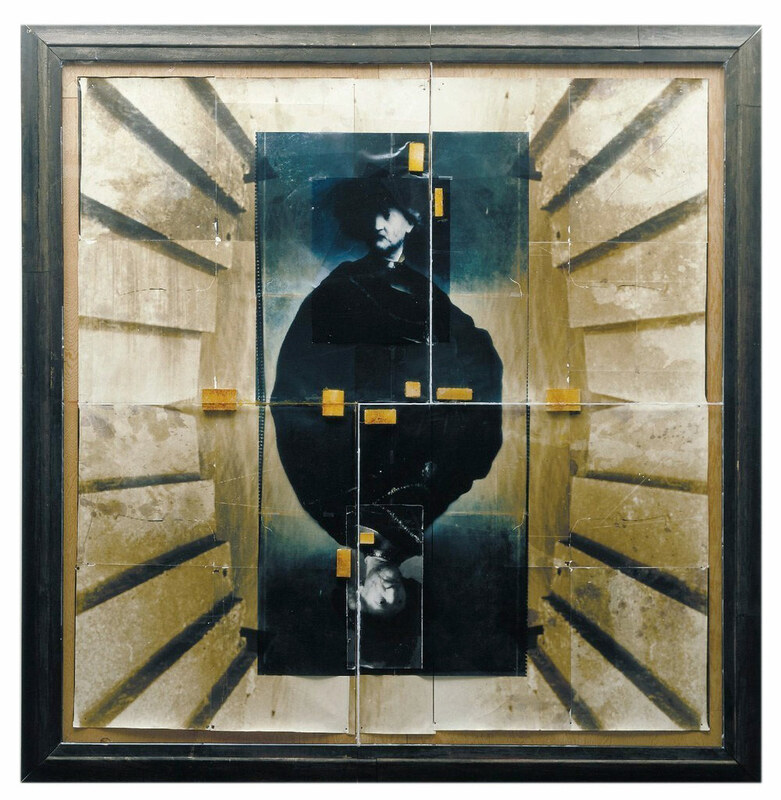 Tracing the creative aspirations of the young David Robert Jones (born 1947 in Brixton, London), it shows how he was inspired by innovations in art, theatre, music, technology and youth culture in Britain during the aftermath of the Second World War. Pursuing a professional career in music and acting, he officially adopted the stage name ‘David Bowie’ in 1965 and went through a series of self-styled changes from Mod to mime artist and folk singer to R&B musician in anticipation of the shifting nature of his future career. 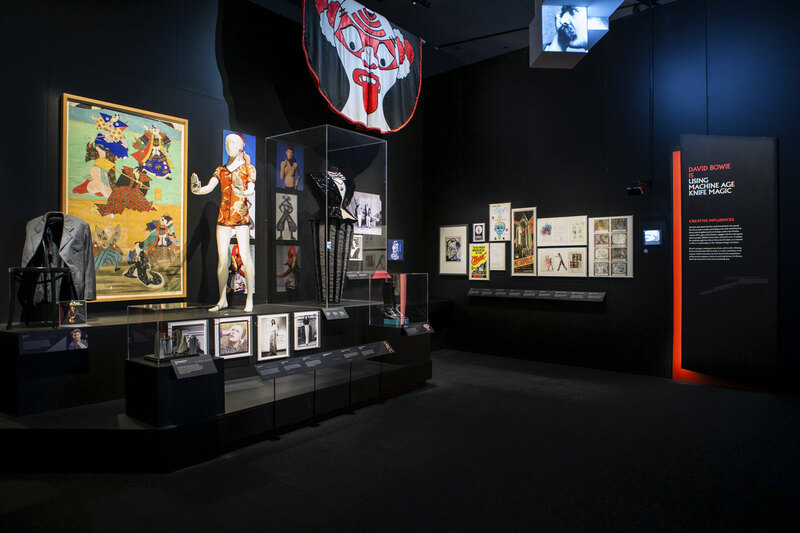 On display are early photographs and Bowie’s sketches for stage sets and costumes created for his bands The Kon-rads and The Delta Lemons in the 1960s. This opening section concludes with a focus on Bowie’s first major hit Space Oddity (1969) and the introduction of the fictional character Major Tom, who would be revisited by Bowie in both Ashes to Ashes (1980) and Hallo Spaceboy (1995). Inspired by Stanley Kubrick’s 1968 film 2001: A Space Odyssey, the single was released to coincide with the first moon landing and was Bowie’s breakthrough moment, granting him critical and commercial success as an established solo artist. 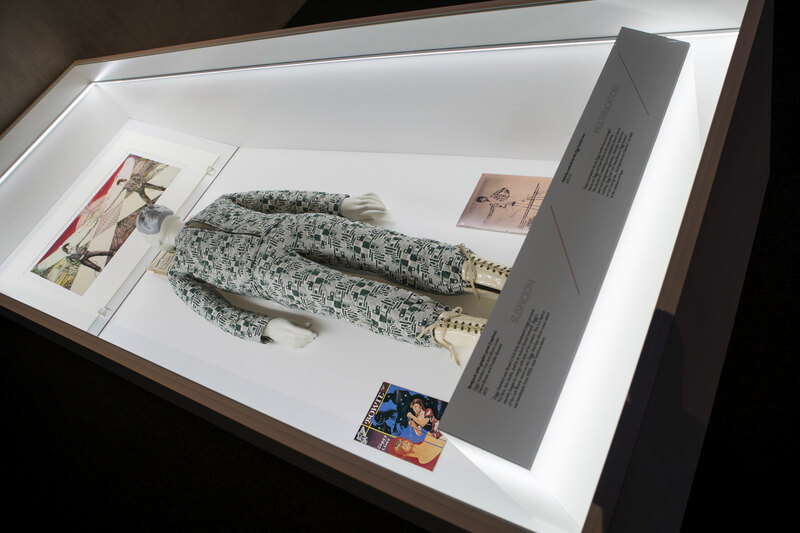 The exhibition moves on to examine Bowie’s creative processes from song writing, recording and producing to his collaborations on costume designs, stage sets and album artwork. 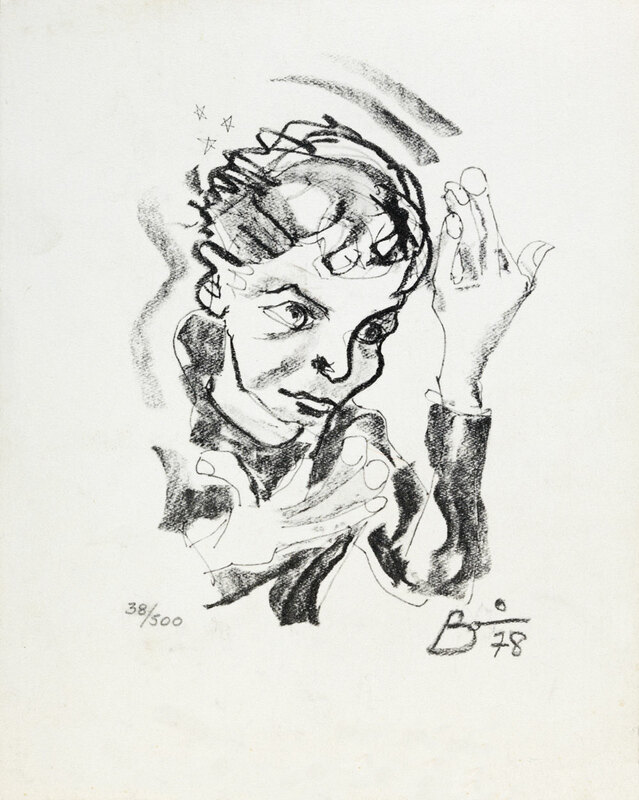 Showing how Bowie works within both established art forms and new artistic movements, this section reveals the scope of his inspirations and cultural references from Surrealism, Brechtian theatre and avant-garde mime to West End musicals, German Expressionism and Japanese Kabuki performance. This section traces the influence of these movements on Bowie’s own work, including the evolution of the lavishly produced Diamond Dogs tour (1974), the design of which was inspired by Fritz Lang’s film Metropolis (1927) and George Orwell’s novel Nineteen Eighty-Four (1949). The tour combined exuberant choreography and a colossal set design, taking the combination of rock music and theatre to new heights. 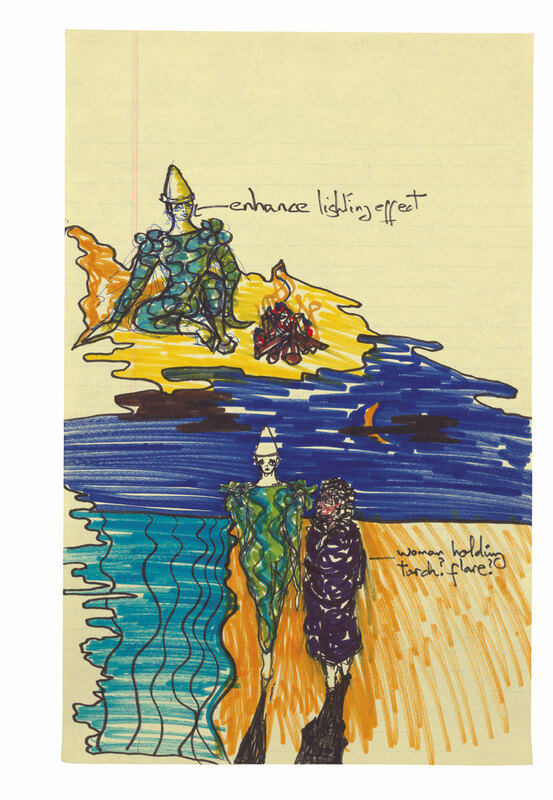 On display are previously unseen storyboards for the proposed musical that Bowie would eventually transform into the Diamond Dogs album and touring show. In addition, this section chronicles Bowie’s innovative approach to creating albums and touring shows around fictionalised stage personas and narratives. 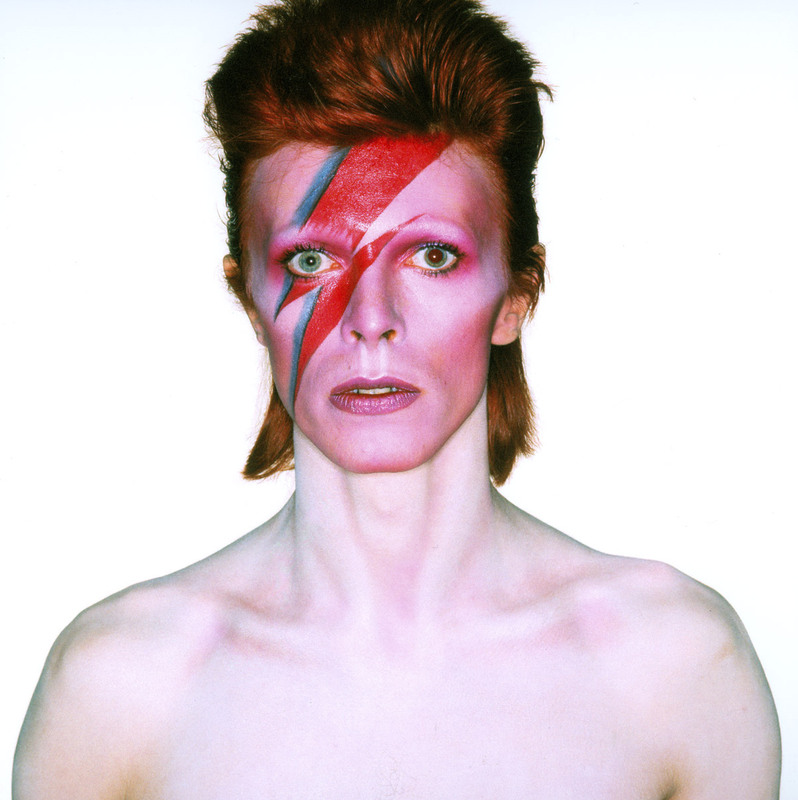 1972 marked the birth of his most famous creation; Ziggy Stardust, a human manifestation of an alien being. Ziggy’s daringly androgynous and otherworldly appearance has had a powerful and continuous influence on pop culture, signaling a challenge of social conventions and inspiring people to shape their own identities. 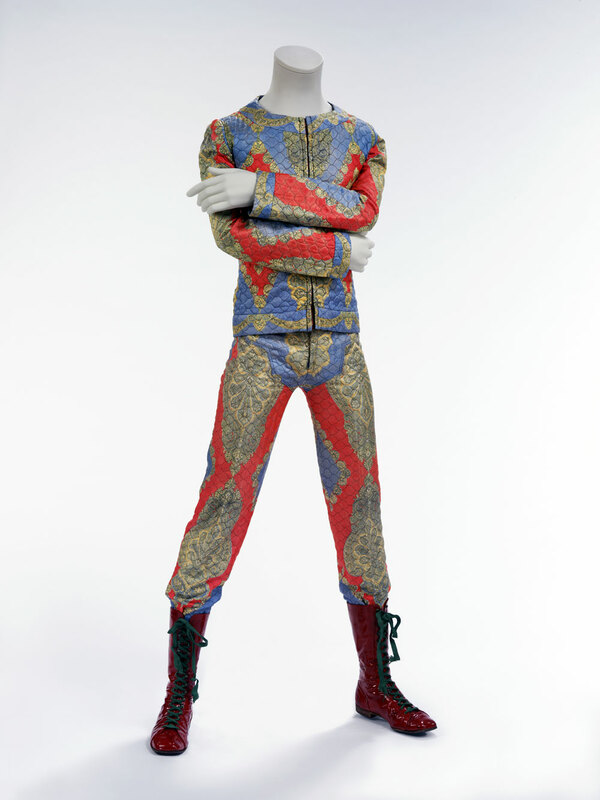 On display is the original multi-coloured suit worn for the pivotal performance of Starman on Top of the Pops in July 1972, as well as outfits designed for stage characters Aladdin Sane and The Thin White Duke. 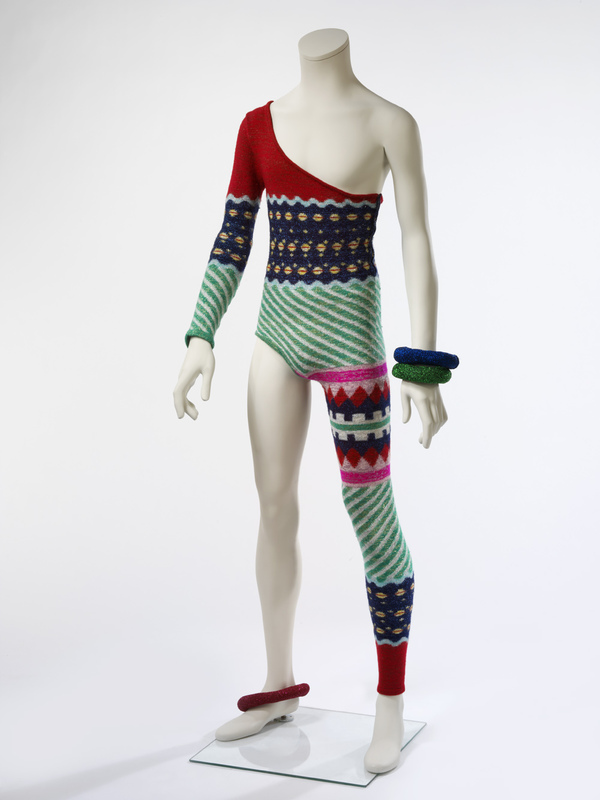 Costumes from The 1980 Floor Show (1973), album cover sleeves for The Man Who Sold the World (1970) and Hunky Dory (1971), alongside fan material, highlight Bowie’s fluid stylistic transformations and his impact on social mobility and gay liberation. Excerpts from Bowie’s on-screen performances in films including The Man Who Fell to Earth (1976), Labyrinth (1986), Basquiat (1996) and The Prestige (2006) show how Bowie has continually explored different notions of character and drawn together the numerous cultural influences that feed into his work. 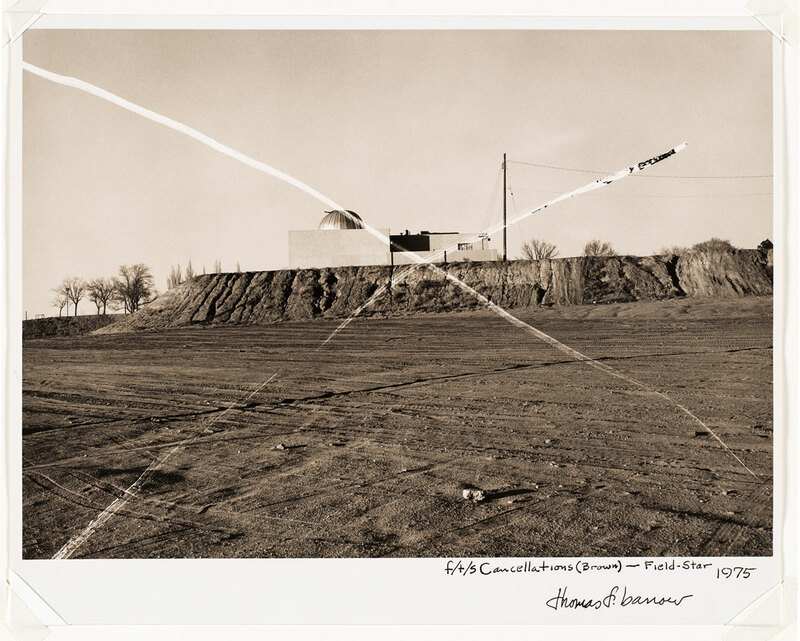 Footage and photography of recording sessions for Outside (1995) and ‘Hours…’ (1999) as well as handwritten lyrics and word collages inspired by William Burroughs’ ‘cut up’ method of writing that have never previously been publicly displayed, reveal Bowie’s working processes from writing to recording. 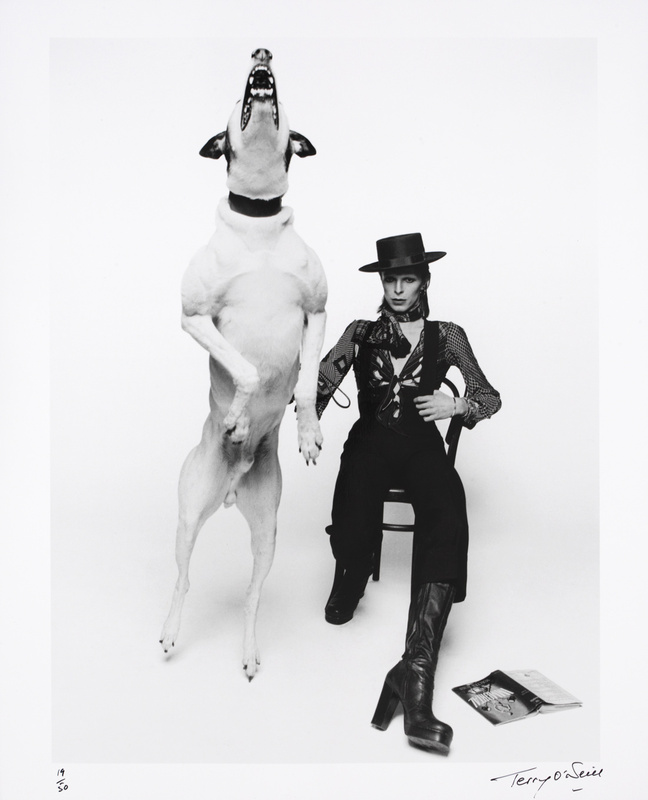 This expansive retrospective also celebrates David Bowie as a pioneering performer concentrating on key performances throughout his career. 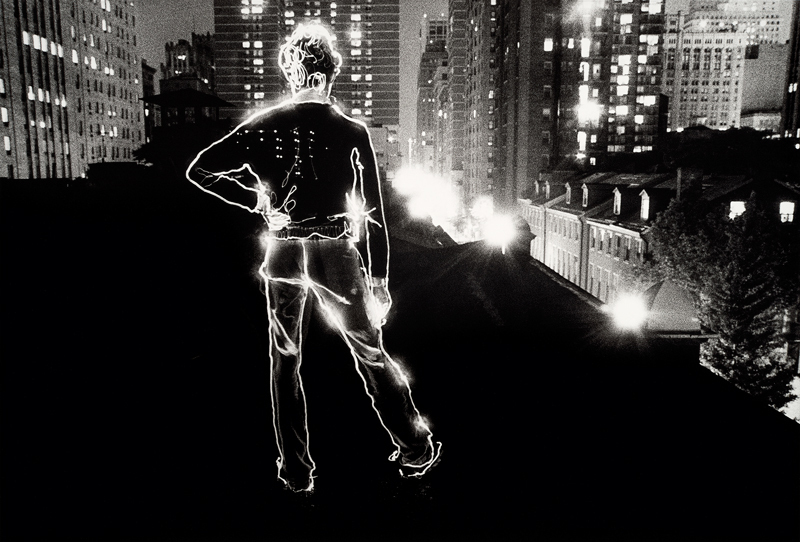 An interactive audio-visual display presents some of Bowie’s most ambitious music videos including DJ (1979) and The Hearts Filthy Lesson (1995). Immersive, large-scale projections show recently uncovered footage of Bowie performing Jean Genie on Top of the Pops in 1973 and excerpts from D.A. Pennebaker’s film Ziggy Stardust and the Spiders from Mars: The Motion Picture (1973). An area has been dedicated to the monochrome theatricality of Bowie’s Berlin period and the creation of the stylish Thin White Duke persona identified with the Station to Station album and tour (1976). It also investigates the series of experimental and pioneering records he produced between 1977 and 1979 whilst living in Germany, known as the Berlin Trilogy. 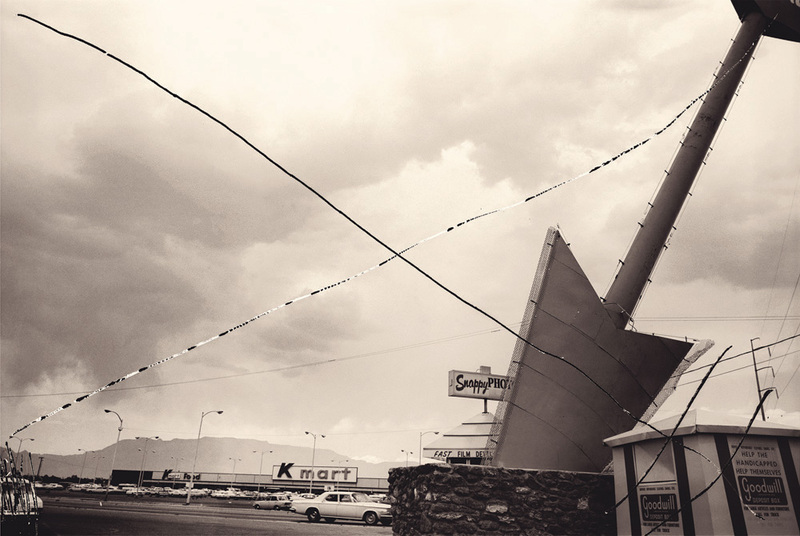 Finally, David Bowie is features a display of striking performance and fashion photography taken by photographers including Helmut Newton, Herb Ritts and John Rowlands. 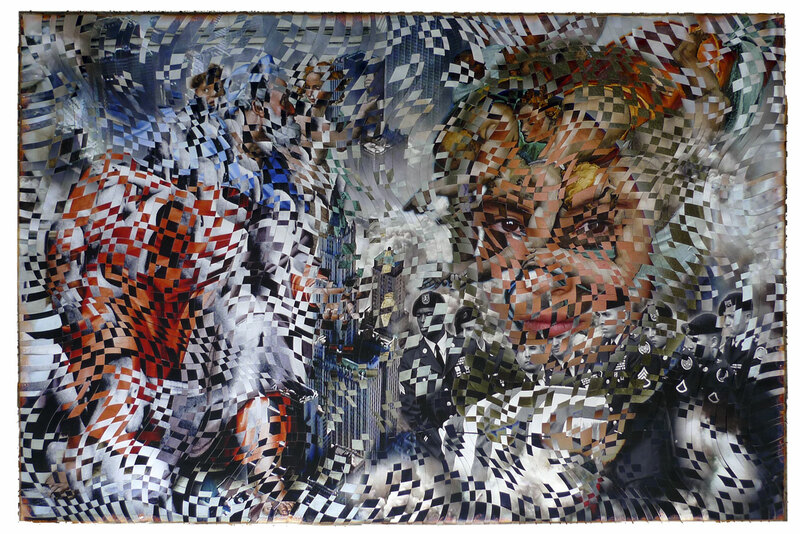 These professional portraits are juxtaposed with a collage of visual projections illustrating Bowie’s immense creative influence and ubiquitous presence in music, fashion and contemporary visual and virtual culture.